Roger Federer beat Richard Gasquet to seal Switzerland's first Davis Cup triumph, then dedicated the victory to his team-mates. The 17-time Grand Slam champion beat France's Gasquet 6-4 6-2 6-2 to give the Swiss an unassailable 3-1 lead. "This one is for the boys," said Federer, who was in tears at the end of the match. "This is not for me, I have won enough. I am just happy we can give everyone in our country a historic moment." Federer, 33, also paid tribute to compatriot Stan Wawrinka, who helped set up the victory in Lille by beating Jo-Wilfried Tsonga before partnering Federer to win the doubles. Federer and Wawrinka were involved in a row at the ATP Tour Finals in London, which the world number two later described as "heat of the moment". "It was Tsonga's elbow, rather than Federer's back, which proved the weak link in the end. Federer's ruthless but straightforward victory seemed inevitable as Gasquet is not a man who enjoys playing on Roland Garros' main court, let alone in front of a world record crowd and with the hopes of a nation on his shoulders. "This has been another triumph for Federer - whose collection could now be considered complete - but also for Wawrinka, who played as well in the final week of the season as he did in winning the Australian Open at the very start." "Stan has put in so much effort over the years. He played an unbelievable weekend and that is what gave me the opportunity today," said Federer. Federer, who lost his singles rubber to Gael Monfils on Friday, played an inspired match as he crushed Gasquet, who replaced Tsonga due to an arm injury. In front of a passionate crowd of 27,448 - a world record for a competitive tennis match - Federer dropped only four points on his imperious serve in the opening set, which he sealed with a whipping forehand winner. World number 26 Gasquet dropped serve in the first and seventh games of the second set, which Federer took without conceding a single break point. He broke the Frenchman twice in the final set to serve for the match and claimed victory with a deft backhand drop shot - collapsing in tears onto the clay at the Stade Pierre-Mauroyto. 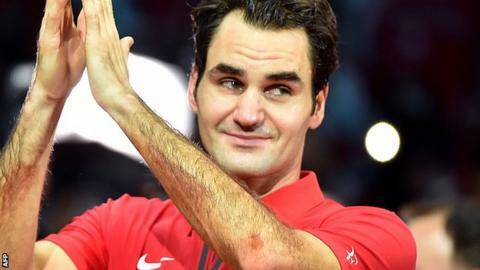 The Swiss win comes a week after Federer pulled out of the Tour Finals title match against Novak Djokovic at the O2 in London to protect a back injury.